Dark Chocolate Raspberry Cookie for Two - What the Forks for Dinner? Love is in the air……..it’s almost Valentine’s Day. 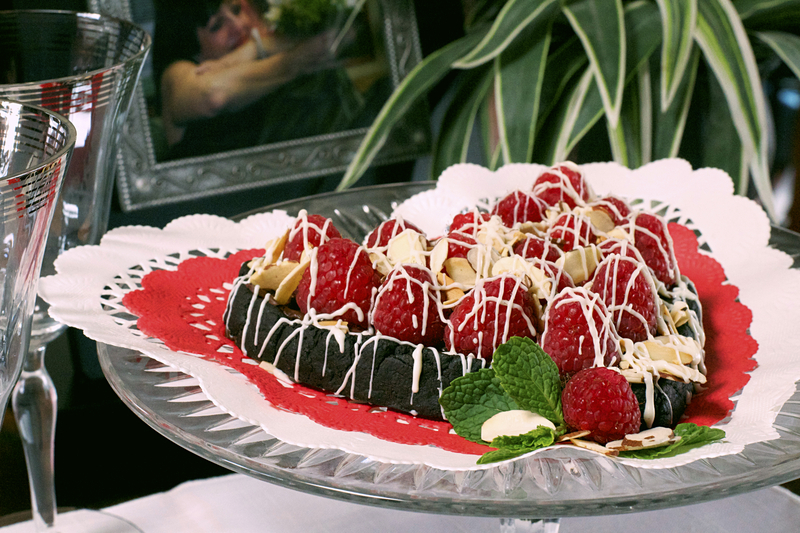 Candy…….flowers……..special meals………indulgent desserts………Dark Chocolate Raspberry Cookie for Two. Last year I made a similar cookie……..except, it was round……….and not dark chocolate. 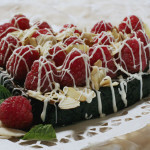 After I made the Chocolate Raspberry Cookie for Two, I started to play around with the recipe. Since Tim and I both adore dark chocolate, that was where I wanted to go with it. Did you know they make dark chocolate cocoa powder? Well, I didn’t either…….color me surprised and delighted. First change ……dark cocoa powder. 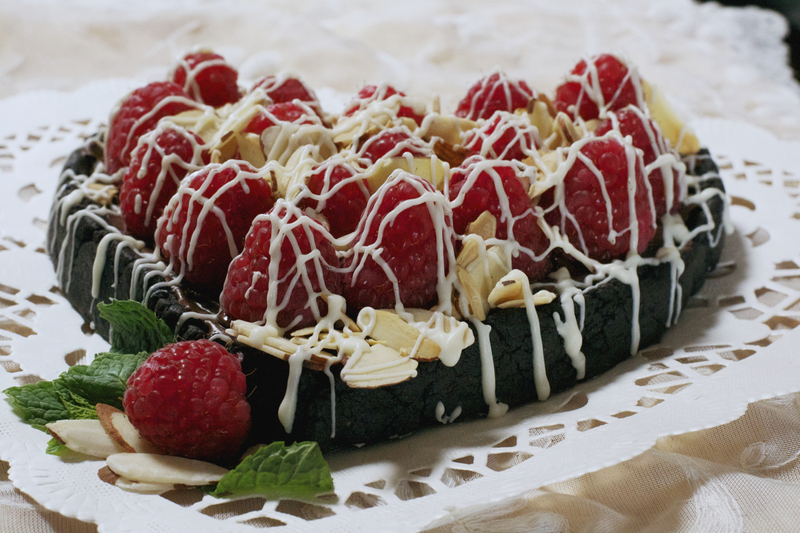 Add dark chocolate chips, keep the raspberries, adding a few more, and almonds. This recipe went from delicious to delectable! Line the baking sheet with parchment paper. It keeps the bottom from burning or sticking to the pan. Draw or trace a heart shape onto the parchment paper as a guide to form the cookie. Under bake cookie just a touch…..they keep baking after you remove them from the oven. 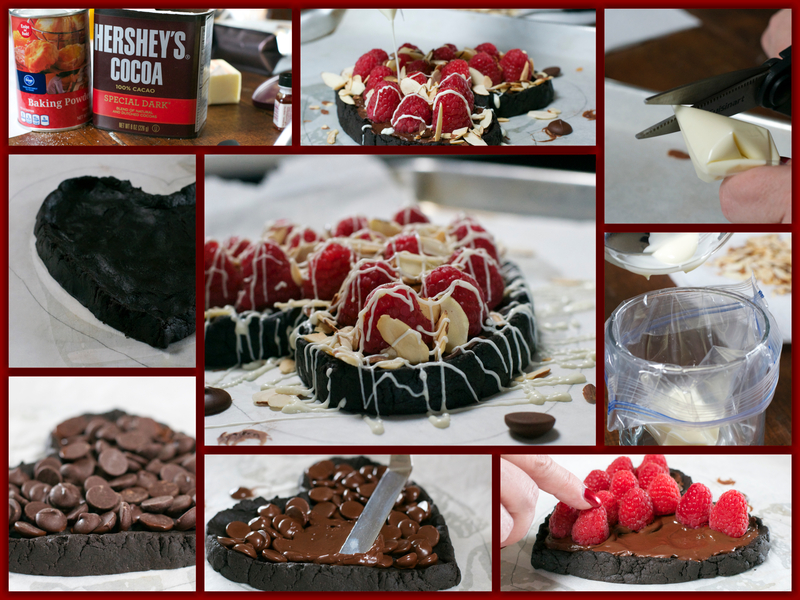 Let the chocolate that you will put on the cookie cool slightly before placing the raspberries but don’t let it harden completely or they won’t stick. To make drizzling the white chocolate on the top a snap, put a baggie in a glass or cup and push the top over the side of the cup to make an opening. Pour the melted chocolate in the baggie,snip off a corner, and drizzle away. Then just toss the bag…….easy! 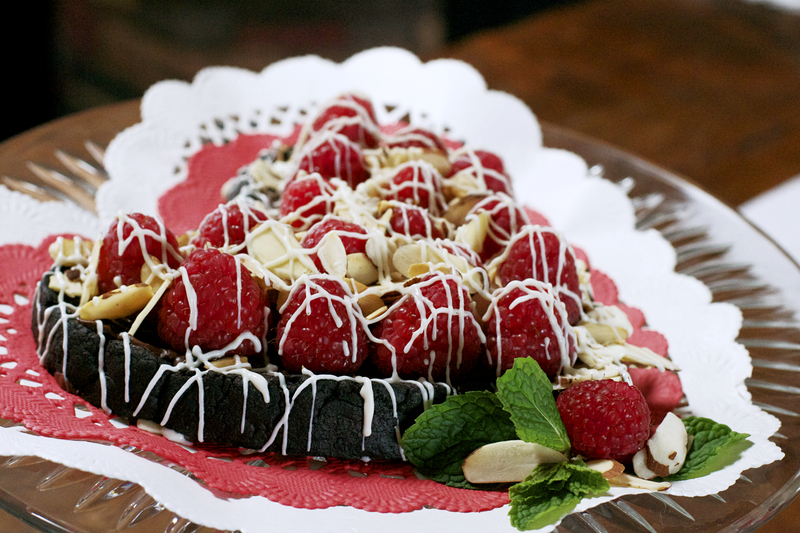 Show your special Valentine how much you care with a Dark Chocolate Raspberry Cookie for Two………..and feel the love! In a small bowl, stir together butter, sugar, egg yolk, vanilla, and raspberry extract. Making sure to blend well so the butter and sugar are well incorporated. Mix the flour, cocoa powder, and baking powder into the sugar mixture. Stir until just combined. Line a cookie sheet with parchment paper. Place dough on lined cookie sheet and shape mixture into a 6 inch round cookie making a slight edge around the outside of the cookie. Bake for 9-10 minutes. Remove cookie from oven and sprinkle the 1/4 cup chocolate chips over cookie and place back in oven for 1 minute. Remove from oven and spread the chocolate chips, over the cookie up to the edge you made. 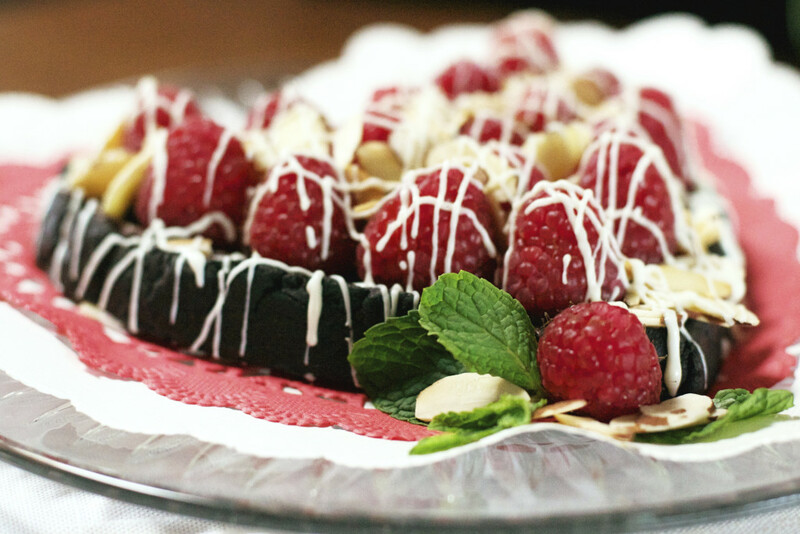 Arrange the raspberries and almond in any fashion you like…….be creative. Melt the 1 oz. of chocolate and drizzle over entire cookie. Serve alone or with a scoop of vanilla ice cream. Wow this cookie looks incredible! So perfect for Valentine’s! If you love dark chocolate this is the cookie for you. Besides who doesn’t love easy elegant!